I thought in this thread we could all talk about how Nibs got wasted when he came here to visit. I actually don't remember much with what happened, but apparently Nibs was wasted. Does anyone know what happened? What about you Nibs? I wasn't actually there... but I'll be he drank something very unusual. Maybe he had a drink of green elixir. He might have had himself a little mixer. Posted: Sun Mar 18, 2018 9:15 am Post subject: It happened again?? I just saw this pic from Peru where it looks like Nibs maybe got wasted again... perhaps! He appears to have eaten some banana pancakes and then was taking some shots of Peruvian liqueur. Remember that a shot glass is the equivalent of a mug for a bear of Nibs' size! 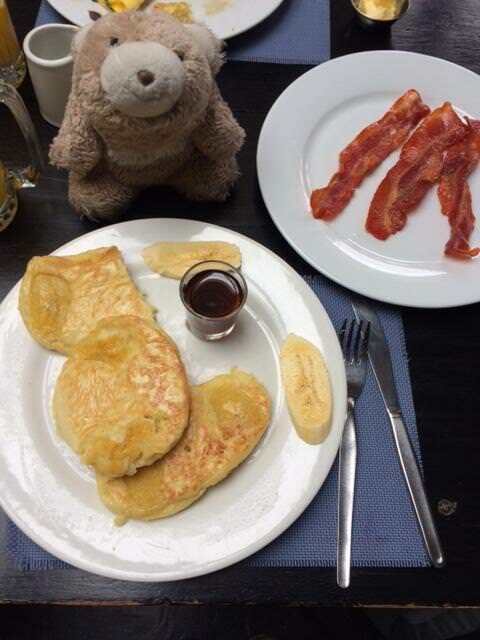 Snuffles it seems you have made a common pancake mistake. Luckily I am a certified pancake technician and can set things straight. What you thought was a shot glass with an alcoholic beverage is actually a container for syrup. This syrup is then drizzled over a pancake. It's a very important step in the pancake process. You can see Nibs is at the pre-drizzling stage in the photo. It's a good thing I happened to check in on this thread - in the future be sure all pancake-related posts go in the proper pancake thread. I guess it will remain a mystery how Nibs got wasted. Well, I guess it was inevitable after Nibs' history of getting wasted and spilling stir fry sauce on his paws - Lee finally got Nibs a bib. Hopefully it will keep his fur stain-free for the foreseeable future. 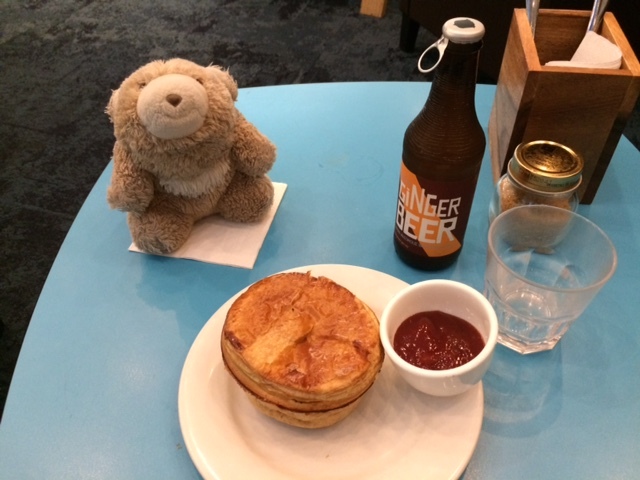 Nibs is in Nib Zealand and it appears he got wasted again - this time he had a cheesy meat pie and downed it with a Ginger beer! Man, what the sneech. You guys, ginger beer doesnt have any beer in it! I just hired a lawyer named David Boies who is going to set matters straight in terms of my reputation and this thread. You will soon be receiving a cease and desist letter to recant any untrue facts about me as well as to return all proprietary trade secrets about me that you may have. If you go along with it, we won't have any trouble. Thanks in advance for keeping my reputation fuzzy.